There is a HUGE furniture warehouse about an hour from where I live. They’re really good at posting photos of their recent arrivals and every now and then, I go looking to see what’s new. Their prices range all over the place, and most of what I like is too expensive to flip. 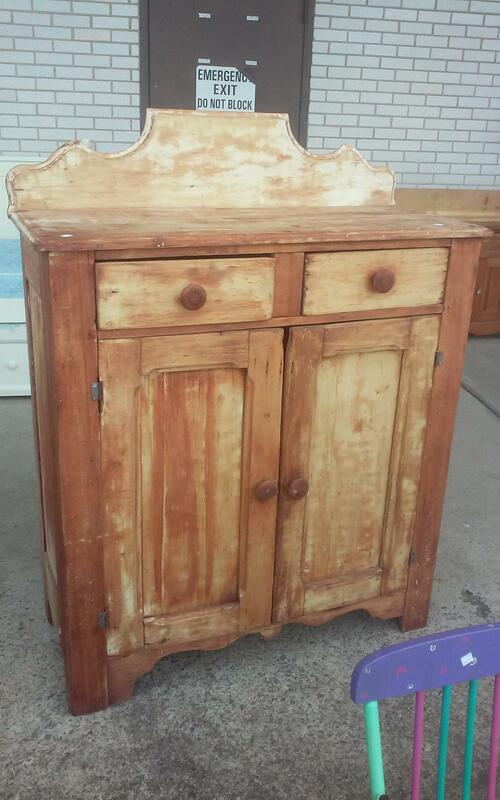 A few weeks ago, I saw this gorgeous jelly cupboard for $145. Now you may be wondering why I’m talking about a jelly cupboard because the title of this post is about a buffet. Hang tight, I’m getting there! My Mom and I took a drive up to the warehouse and checked the cupboard out. It was nice, but it was going to need a bit of work to get it up and running. Plus, there was something weird about it. I couldn’t quite put my finger on it, but I didn’t love it as much as I thought I would have. We went inside to see if there were any other goodies and I spied this Sheraton style piece. It was pretty much flawless aside from a small chunk missing from the top rim. 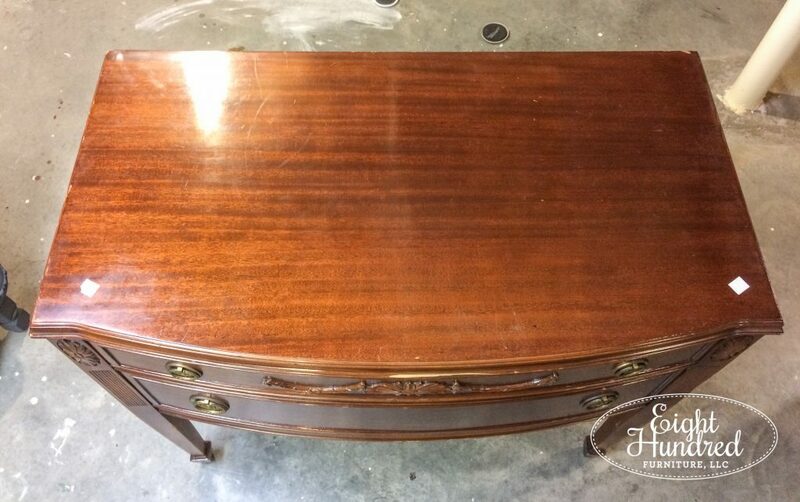 You can see it just about the flower design on the top drawer. 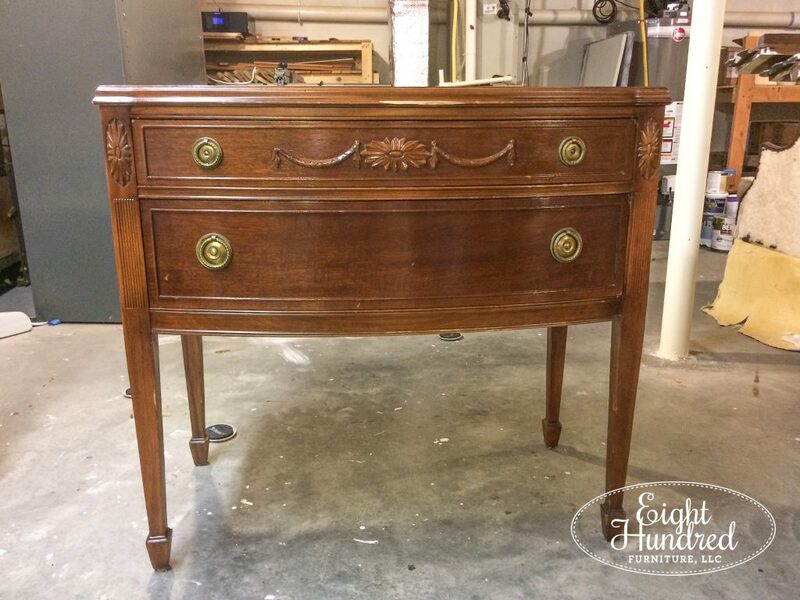 The piece had beautiful hardware, clean drawers and a lovely bowed shape. 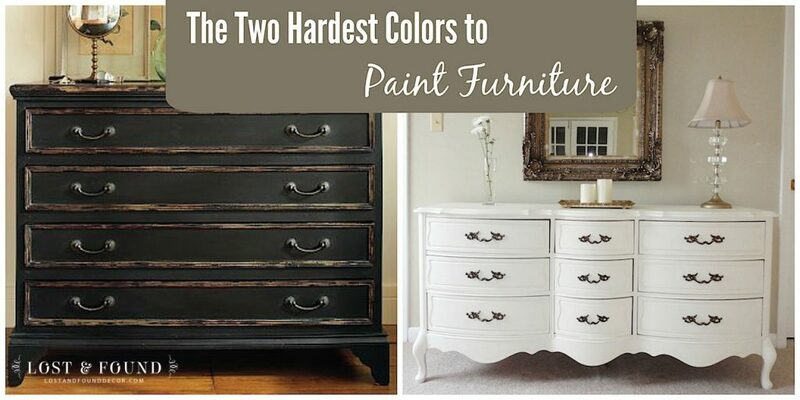 If you’re someone who doesn’t like to see furniture painted, you may want to stop scrolling at this point. While this piece was pretty the way it was, I saw it done up in a beautiful stark white. With a whitewashed top. The first step was to strip the super thick layers of poly off the top, so I turned to my favorite stripping product, Citristrip. I buy mine from The Home Depot. After stripping, cleaning and sanding the top, I attempted to whitewash it. Folks, it did NOT go well for one main reason – bleed through. The top had some sort of reddish stain that was peeking through my white paint wash, and when I was finished, the top looked purple. No joke. 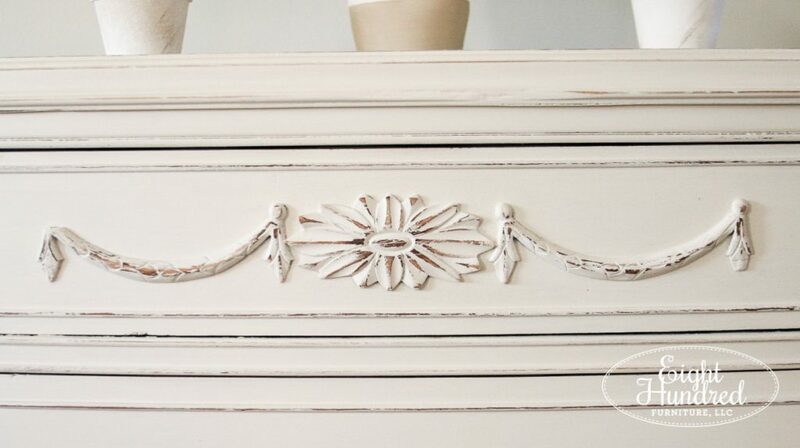 Unfortunately, I couldn’t stain over it at that point, because I had used Milk Paint to do the whitewashing. 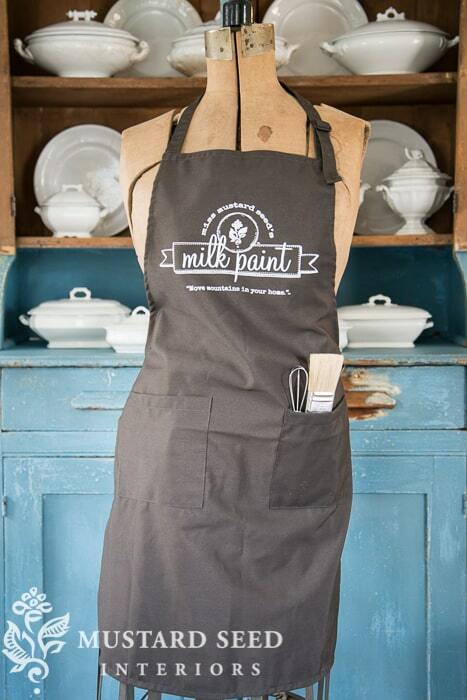 Milk Paint is designed to soak in like a stain, and there wasn’t any way it was going to sand out. Plus, the top was veneer, so if I did any more sanding, I ran the risk of burning through it to the base wood underneath. 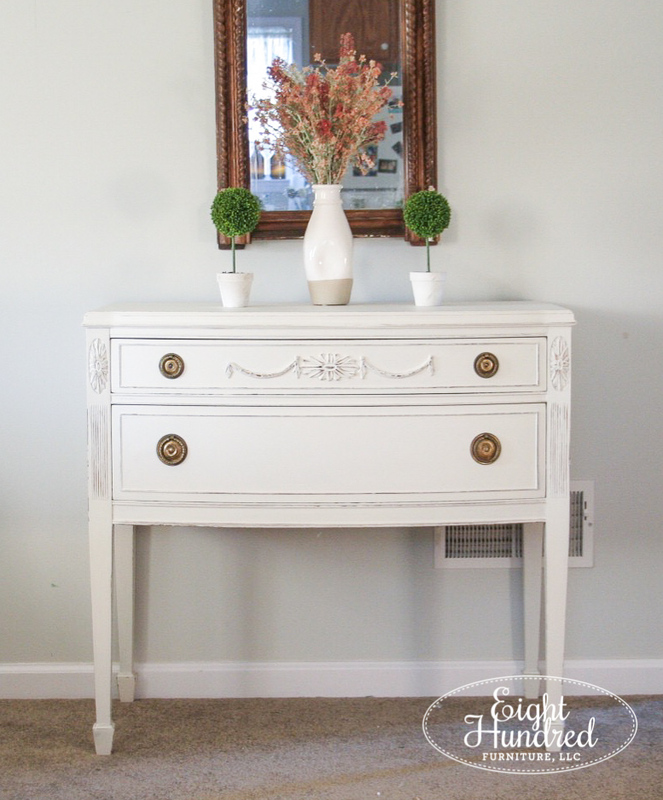 So, I stayed flexible and I decided I would paint the entire piece white – top and bottom. My white of choice was Miss Mustard Seed’s Farmhouse White. 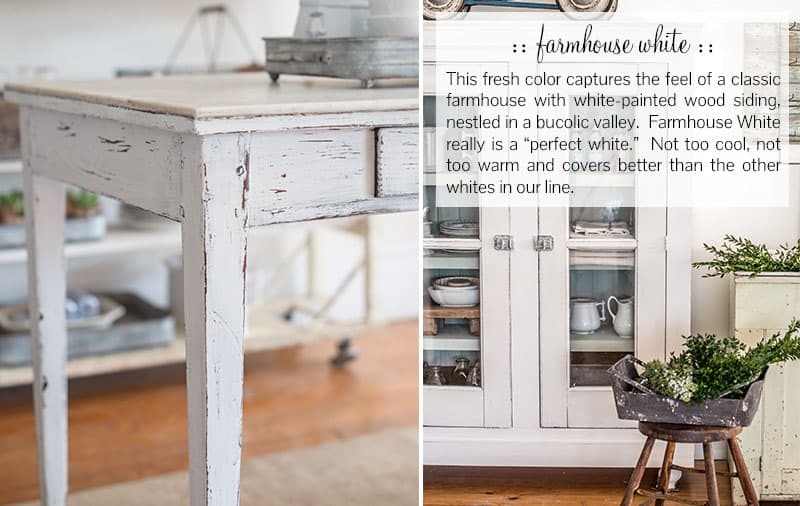 Farmhouse White is the brightest white in the MMS Milk Paint collection, and it has the best coverage. Here’s how it compares with the other whites in the line. 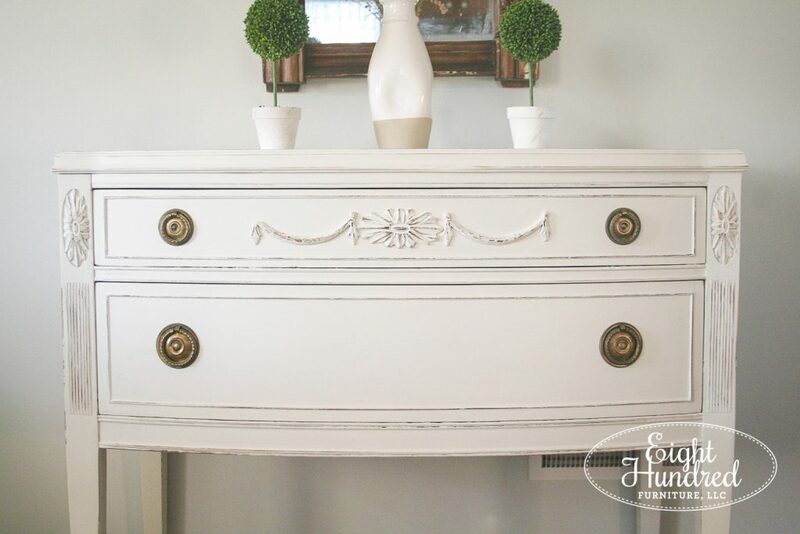 Before I painted, I had to do some serious scuffing on the buffet because it had an extremely shiny and thick layer of poly over it. 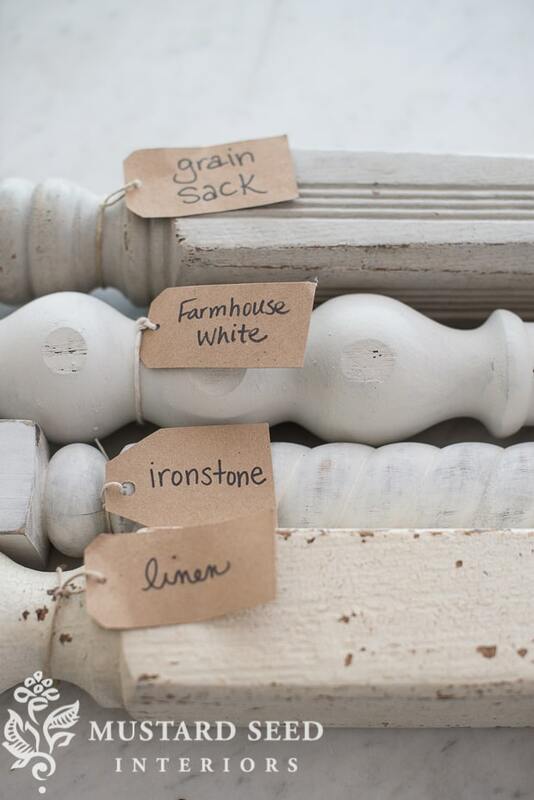 I’m asked about the preparation stage of using Milk Paint all the time, and for good reason. I’ve also been experimenting with different prep methods including primer, shellac and using chalk-type paint as a base. I can honestly say that I get the best results when I scuff with sandpaper by hand. I know it’s a lot of work, and it takes longer than the other methods, but my results are consistent and I get my usual amazing milk paint finish. If you’ve found another method that works better for you, I’m happy! For me, I think I’ll always have to scuff my pieces prior to painting and be patient in the process. 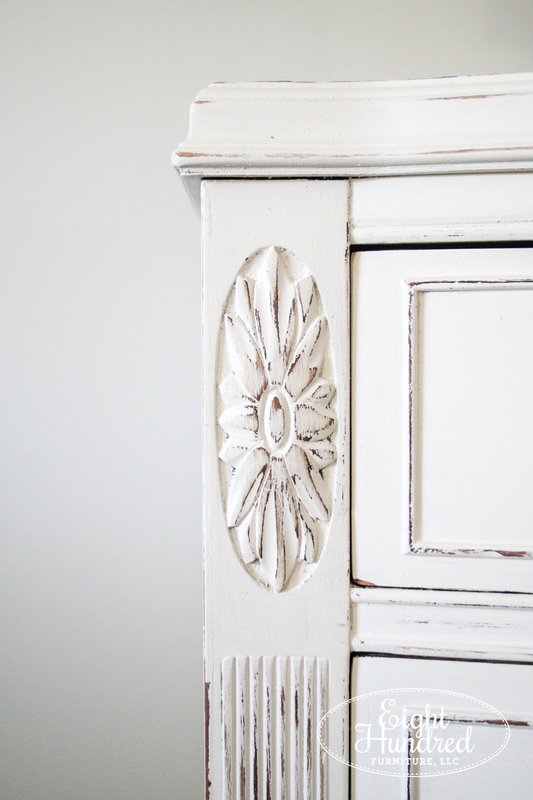 Getting the coverage I wanted took three coats of Farmhouse White. 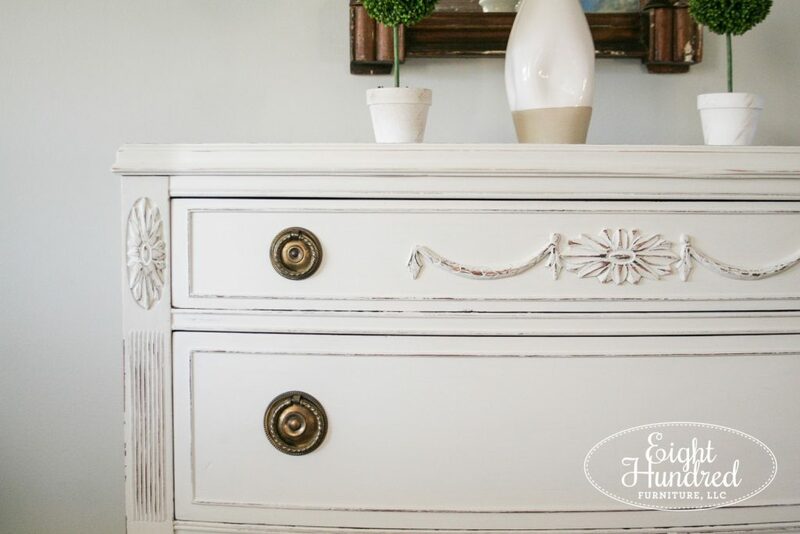 While it has the best coverage of any of the whites in the collection, white paint is notoriously difficult to get full coverage with just two coats. 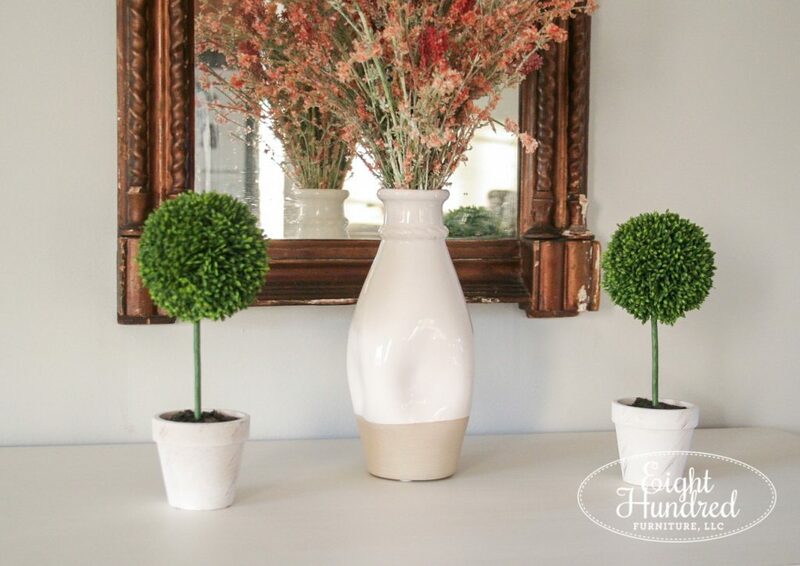 Actually, Melanie of Lost & Found Decor in Texas wrote an excellent blog post about why white is such a hard color to paint with. I suggest you give it a read! After three coats of Farmhouse White (and now you understand why it required three), my piece was ready to go! Staging it was a bit of trial and error. Here is my Instagram story from the other day chronicling my decisions for staging props. 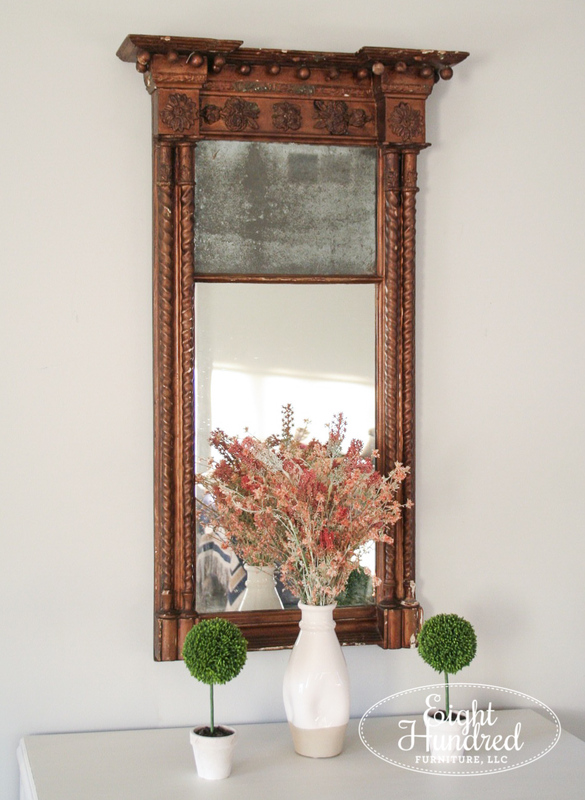 That lovely oval mirror was purchased from my buddy Lisa at Morgantown Market. She has a lovely space downstairs with me. If you’ve been there before, she’s the vintage clothing lady! She had it available for a great price, so I scooped it up. While it didn’t work for this particular piece, I’m sure I’ll find a need for it down the road! 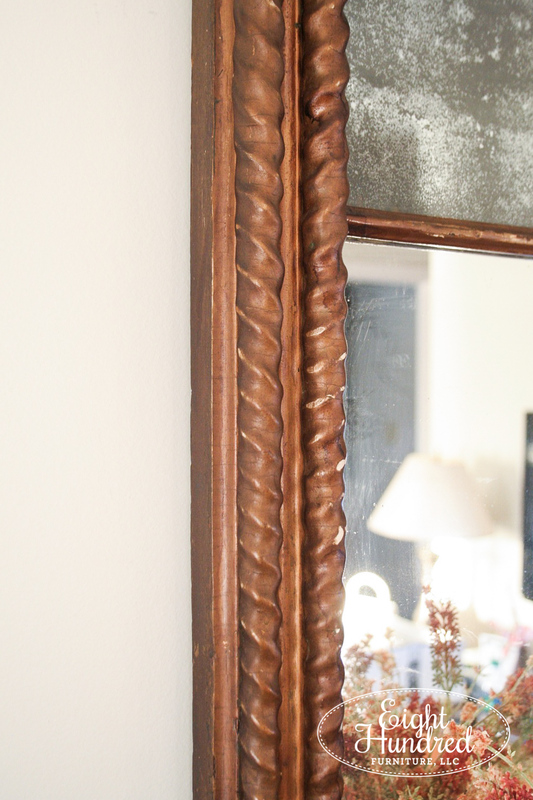 The mirror I actually did wind up using was purchased next door to Morgantown Market at the Old Mill Property. It’s so nice having two antique shops right next to one another. You can pop back and forth and see what each has to offer. They have very different “feels” when you walk in and you get to experience two unique antique environments. My Mom actually spotted this sitting on the floor in one of the booths by the downstairs register. It was old and absolutely lovely! Just look at that top! 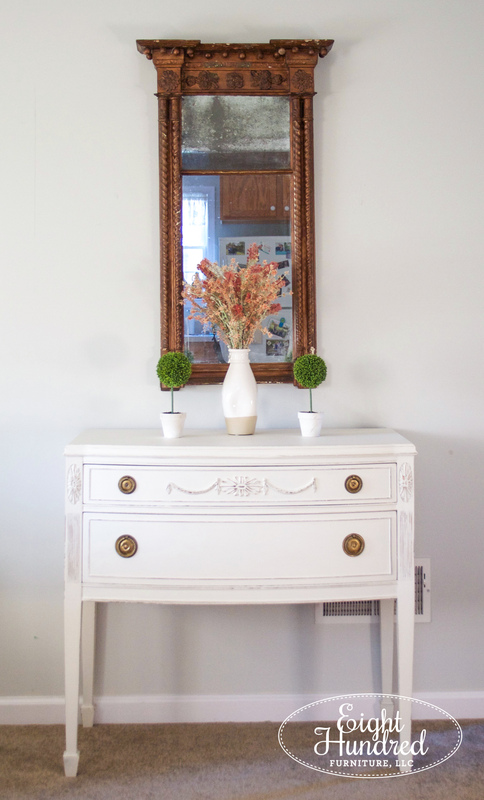 Between the de-silvered top mirror and those flowers, I just couldn’t help myself. Plus, it was dirt cheap given its details and its age! It has the prettiest rope twist all the way down each side. 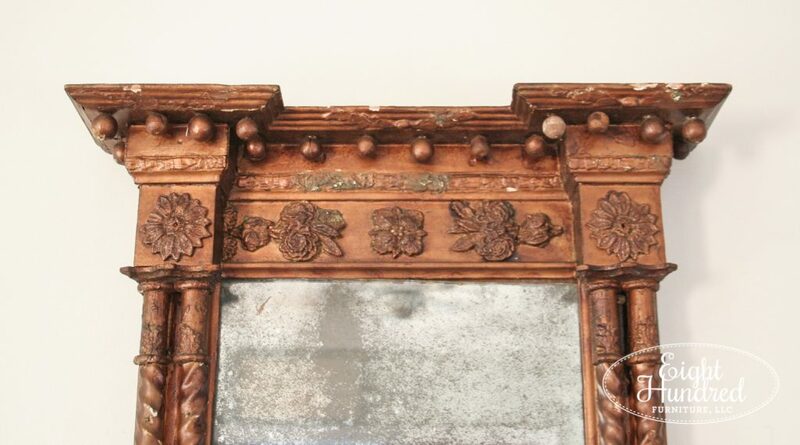 Here’s a good shot at that de-silvering on the top mirror. While that may bother some people, I think it’s charming. It took a little bit for me to figure out how I wanted to stage this piece with what I had available, but in the end, here’s the configuration I settled on. 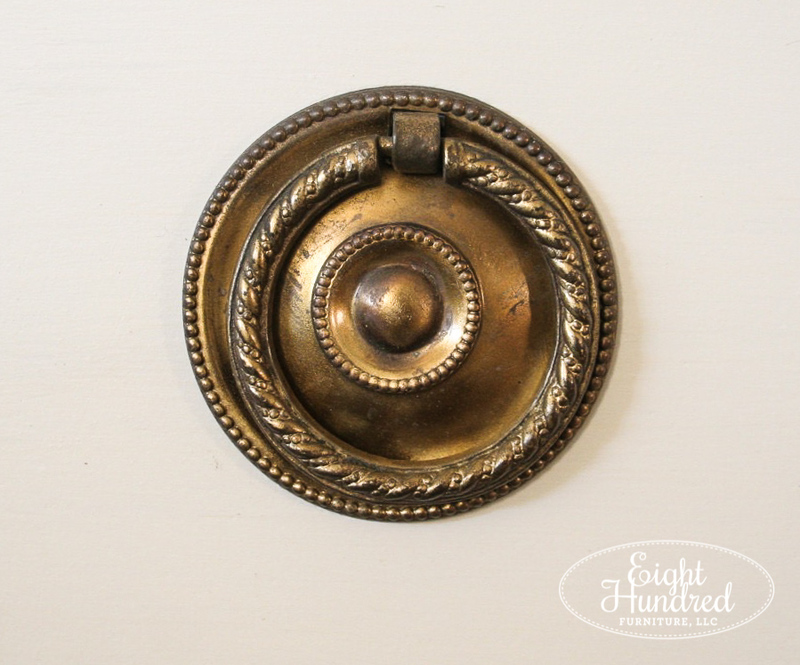 I wanted a mirror that was close to the color of those beautiful ring pulls to tie them in. When this piece was wood, you really couldn’t see how beautiful they are. Now that the body is white, there’s more of a contrast. I went back and forth on how much I wanted to distress this piece. In the end, I decided to go a little heavier so the beautiful details would be more noticeable. The bow shape of this piece is subtle and beautiful! The tapered legs and spade style feet give it that clean Sheraton feel. 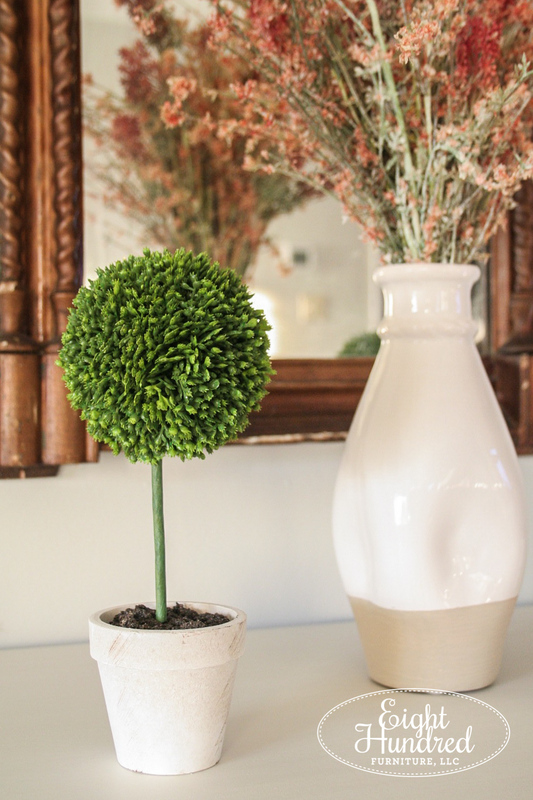 I picked reddish-pink artificial flowers for the center and complimented them with faux green topiaries. I really like how these colors pop against the dark almost metallic patina of the mirror. 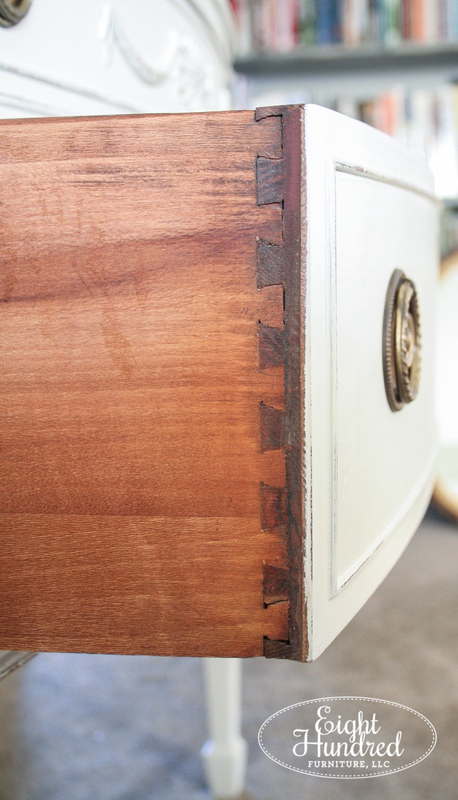 The drawers are all solid in construction, they slide easily, close flush, and have dovetailed joints. 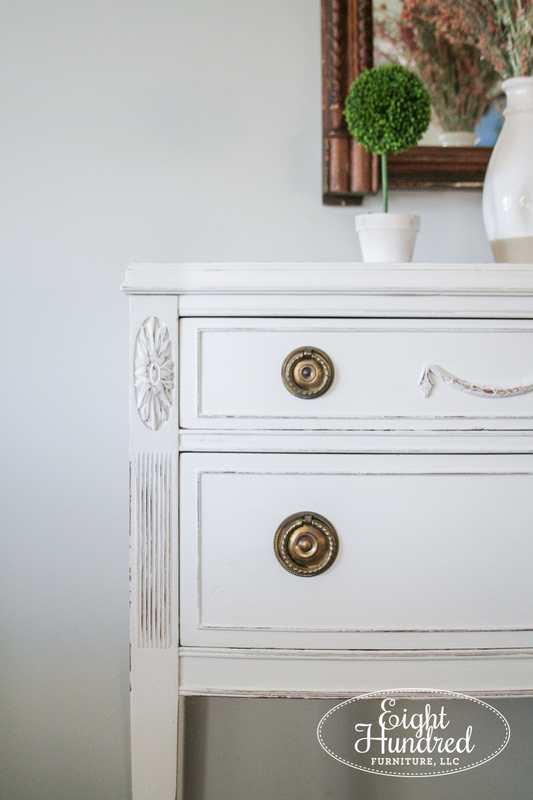 I didn’t take the paint all the way around the edges of the drawers, but rather left a clean line to match the clean feel of the piece. My sealer of choice was Miss Mustard Seed’s Tough Coat. Since this piece is white, I wanted a topcoat that would give it the ultimate protection against marks and smudges. This piece is currently available for $285 plus tax. It measures 36 inches long, 20 inches deep at the crest of the bow shape, and 33 inches tall. Send me an email if you’re interested in purchasing it! I can deliver for a fee as well, depending upon your location. Like the look? 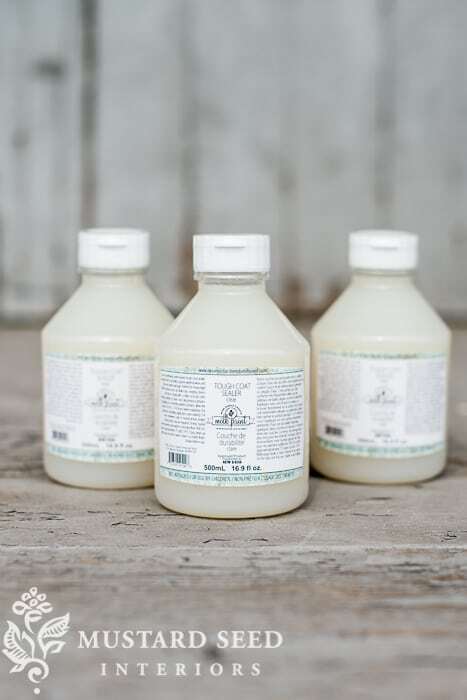 Shop for Farmhouse White Milk Paint and Tough Coat sealer in my Milk Paint displays at Painted Table Designs and Morgantown Market! Too far away to visit? We can talk about shipping paint products to your doorstep!